One of my newest clients is in a highly competitive business in which they sell similar products as other retailers. These days, many online retailers have a hunch that they are being “Amazon-ed,” which they define as visitors finding products on their website and then going to see if they can get it cheaper/faster on Amazon.com. This client was attempting to use time spent on page as a way to tell if/when visitors were leaving their site to go price shopping. Unfortunately, I am not a huge fan of time spent on page, since a page could have wide varieties of time spent on page due to many other reasons other than price shopping (i.e. working, going to the bathroom, yelling at kids-in my case, etc.). Because of this, I wanted to come up with an alternative way to see if price was a potential reason for lost business. However, before I share my idea, I want to add a disclaimer that there is no [legal] way to really know if people are leaving your site to buy something elsewhere due to price, but the technique I will show may shed some light on how pricing impacts your conversion rates. Next, you will have to talk with your Adobe Account Manager to create a new DB Vista Rule. As a refresher, a DB Vista Rule allows you to populate SiteCatalyst variables with values from a database lookup table stored on Adobe’s secure servers. This will allow you to pass in the competitor price for each product viewed and added to cart on your website via a server-side lookup. The Adobe Engineering Services team can walk you through how to upload the competitor prices to DB Vista and how to updated it over time. Keep in mind that you will need to have a process in place that updates competitors’ prices as they change, preferably within the hour so your data is accurate. This is often done by FTP’ing changes on an hourly basis. Creating a DB Vista Rule will cost you a one-time fee of a few thousand dollars, but that you can maintain it yourself thereafter. If you want to save some money, you can ask your internal developers if they can ping a similar competitor cost table in real-time as visitors are on your site, but in my experience, the work effort around that is much more than the cost of the DB Vista Rule. 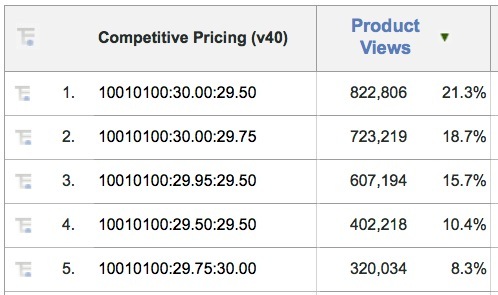 In this fictitious example, you can see that Orders per Product View was up significantly when pricing was the same or better than the competitor for the product in question. Obviously, the last few reports can still be viewed by Product by simply using the Products variable breakdown, but I think they show a good high-level view of pricing impact. Keep in mind that each of these rows can be trended over time in SiteCatalyst or ReportBuilder to see a long-term effect. Keep in mind that all SAINT Classifications are eligible for use in Segmentation, which means that you can now build a segment using pricing differential to competitors and product margin as criteria when doing web analysis! Also, if you want to learn how to add product costs as a new metric with which you can calculate product margin as a KPI, check out my old blog post from 2008 on how to do that. As I stated early on, there is no way to make a direct connection between people looking at your site and then price shopping on another site, but my theory is that if you consistently under-perform when you are priced higher than your known competitor(s), this approach may give you some data to validate your theories. Obviously, there are other factors such as shipping, taxes, etc. that can have a major factor, but some of those can be included in this solution as well by simply adding additional parameters to the eVar shown above. Other ways to do similar competitive analysis include using Voice of Customer surveys to ask your visitors if they are price shopping, or moving all SiteCatalyst and competitive data into Adobe’s Data Workbench product. Either way, if you like the concept, you can give it a try or contact me if you want some assistance. If you have other ways to do this, feel free to leave a comment here. Thanks! Great post! How would you propose handling multiple competitor prices? Would you pass through multiple competitor prices in the product string? An average? The lowest price?